Years ago miners would carry a canary into the mines to act as a primitive air quality test. 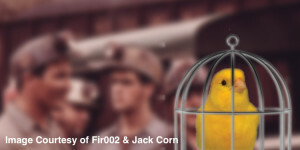 Canaries, it seems, are much more sensitive to the air quality so that when miners saw a bird in trouble, they knew to get out quickly. So what does this have to do with Bees you ask? I am making a case for Bees being society’s “canary in the mine” by warning us of the environmental and health consequences of the path we are currently on. The very survival of these, as well as other pollinators, is at risk now due to something called Colony Collapse Disorder. The convergence of multiple factors, such as poor diet, stress, pollution, infection, pesticides, climate change, and more have created conditions that have significantly decreased the number of hives (just this past year by over 40%). Does this sound familiar? Aren’t humans under a similar assault? And the Bees are more than our environmental bellwether. One third of what we eat relies on Bees for pollination, including apples, walnuts, berries, coffee, and my summer favorite, watermelon.